Arsenal 3-0 Chelsea – A Didier Drogba Tweet sums up the Chelsea performance. For the second week running, Chelsea were hammered by the opposition in the first half and lost the game. 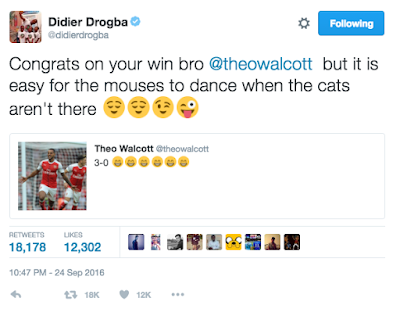 As a result Didier Drogba took to his social media account and has best described what happened at the Emirates last night. Unfortunately, Drogba is spot on and it really was men against boys in the first half, which is the most disappointing aspect. We looked a total shambles at the back, our shape was awful with Diego Costa isolated up against their two centre backs, our midfield were sat too far away from him but not close enough to our back four and Arsenal took full advantage. How many times in that first half did we see Arsenal find someone in those gaps, in space and with time to run at us? Something was seriously wrong in that first half, here was no intensity to close the ball down from anyone. The Arsenal players could not believe their luck as they pressed us high and just eleven minutes into the game were rewarded by a defensive error from Chelsea for the fourth game in succession. Antonio Conte was quick to tell the press that he did not want to single out individuals for any errors. He explained that we win and lose as a team, which is commendable, but surely Gary Cahill needs to sit down and look at the errors he has made in recent weeks. 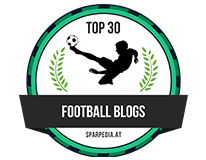 Against Swansea he was fouled but gave Leroy Fer an opportunity to challenge for the ball by taking too much time making a decision to pass the ball back to Thibaut Courtois. Cahill lost possession and Swansea scored. Against Leicester, his hesitation in our box led to indecision between him and Asmir Begovic and we conceded another goal. Last night, against Arsenal, the exact replica of what happened at Swansea played out once again, but this time he was never fouled but misplaced his attempted pass to Courtois and Alexis Sanchez punished us to make it 1-0. I cannot understand what has happened to Cahill in recent weeks. It’s obvious that he needs John Terry next to him to talk him through games at the moment. When he acts on instinct to close people down or to make important blocks/challenges he is at his best. However, it’s his basic use of the ball that has let him down and is affecting his confidence without question. Antonio Conte must make a decision over the future of Branislav Ivanovic at right back. As we have seen for the past twelve months, his time playing in that role is over and he must now be considered as one of the three centre backs or nothing at all. The defensive performance from the whole team was seriously shocking and I have to say that N’Golo Kante was all over the place which was also a surprise. It was almost as if Cesc Fabregas who was non existent because of how deep we were playing, Nemanja Matic and Kante all had a licence to go one at a time and push forward. There was no holding midfielder, there was no one playing in the one position that has become arguably the most important and it caused us massive problems with our back four being exposed time and time again. 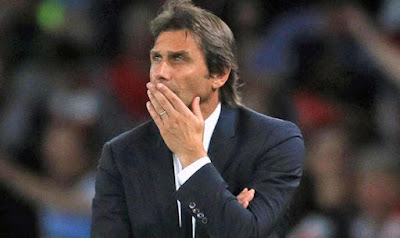 Conte stated in his post match interview that we started with the wrong attitude from the first minute and we have to ask why this was the case? Surely it’s the manager’s job to motivate his players, to set them up in a tactical formation that would give us the best opportunity to win the game and for his players to have confidence in what they are being asked to do? How on earth can the obvious disconnect between what they have been asked to do, compared to the performance they gave is the main problem he has this morning? We can all understand that players will have off days and days when nothing goes right but this is now two games running that Eden Hazard and Willian have been non-existent and a shadow of themselves. For that to happen in the two biggest games of our season so far, against direct rivals for a top four finish, is far from acceptable and both should be called to account for their performances. If they are not 100% committed to Conte and what he demands from them, they should both be dropped until they accept responsibility. Plenty was made of Eden Hazard when Jose Mourinho was in charge and what was expected of him without the ball. Mourinho wanted all of his players to work hard to win the ball back, to get themselves in defensive positions to become compact as a defensive unit. We know that Hazard struggled to accept that role and this was highlighted two/three seasons ago in defeat against Atletico Madrid at home. Hazard was caught out twice that night for two goals. Last night, Eden Hazard was caught out as Arsenal with a flowing move, ripped Chelsea wide open once again. 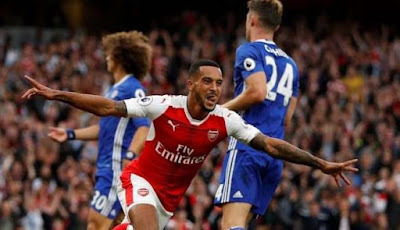 Chelsea did not close the ball down on the edge of our box, the ball was played to Bellerin who was free down our left hand side goal side of Hazard, who had reacted far too late the his run forward and Bellerin crossed the ball first time to Theo Walcott unmarked in the box to slot him from twelve yards to make it 0-2. At this point, Chelsea were all over the place through midfield and at the back and only fifteen minutes had been played. This looked like it was quickly turning into a nightmare, which was compounded late in the first half as Arsenal broke on the counter attack from a Chelsea corner and punished us again. As the ball is half cleared it comes out to Mesut Ozil who, twenty-five yards from his own goal, facing his own box feels Kante closing him down to make a challenge for the ball, turns him and is away. Cesar Azpilicueta, Branislav Ivanovic and Kante are now all out of the game and virtually give up chasing back as Arsenal have put themselves in a two against two situation. Ozil plays the ball to Sanchez who makes a run wide and the Chilean forward chips the ball back over to Ozil, beyond Luiz and Cahill and the German strikes the ball into the far corner giving Courtois no chance at all to make it 0-3 and game over. At half time it’s obvious to me and everyone else that changes need to be made to try to make some sort of impression on the game. Chelsea need to rethink their tactics and the playing personnel that are to go back out on that pitch to have a go at Arsenal as we have nothing to lose here. However, for one reason or another, Conte decides to send the same players out, in the same formation? Questions need to be asked. Ten minutes pass in the second half and Chelsea are still struggling so only at that point does he make a change. 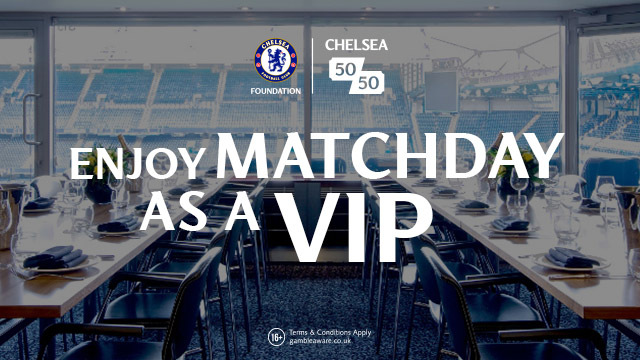 Marcus Alonso comes on for Cesc Fabregas as a left wing back; Azpilicueta switches over the right hand side with Ivanovic now playing as part of three centre backs alongside Cahill and Luiz. The problem we have is that it takes us ten minutes or so to sort ourselves out which gives Arsenal more opportunities to open us up. This time however, they are unable to take advantage. As the game plays out, Chelsea dominate possession as Arsenal are more than happy to sit back on their lead. Chelsea continue to stroke the ball around from side to side without any purpose as Diego Costa still remains isolated until, with around twenty minutes to go, Hazard and Willian are replaced by Pedro and Batshuayi which in my opinion is far too late in the game. David Luiz late on, strides forward and plays the pass of the game to Batshuayi who has made a fantastic run but it denied by Petr Cech. It proves to be our only shot on target in the whole game. It’s an unbelieveable statistic considering our recent record. Arsenal win the game and as I said it was well deserved after a first half performance that took advantage of our uncertainty at the back. This game was there for the taking and Chelsea simply never turned up. Antonio Conte has major problems now and he must make changes ahead of Hull next week. We simply cannot continue with the same players in the same formation. This is a critical time for Chelsea and for Antonio Conte.